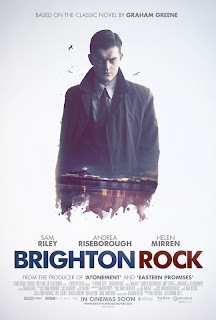 If there is an ideal audience for first-time director Rowan Joffe’s (screenwriter of THE AMERICAN and 28 WEEKS LATER) pseudo-noir mob drama BRIGHTON ROCK, I’m not sure who they are. That isn’t to say the film, which is shot with the crisp scene blocking and over-saturated color pallet (though, thankfully, sans spastic Guy Ritchie editing) that have become visual signatures of modern British gangster films, isn’t likable. Joffe’s loving recreation of 1960s Brighton, a ramshackle, blue-collar resort town plagued by riotous brawls and boardwalk skirmishes between the scooter-perched Mods and leather-clad Rockers, will thrill any lover of British historical dramas. And gangster flick aficionados will find at least a single serving of cinematic comfort food in the intra-gang power jockeying that drives the film’s antihero, cold-hearted Youngblood Pinkie Brown (Sam Riley), to ascend the ladders of power by way of dizzyingly deplorable moral chutes. Love affairs are doomed, religious faith is forsaken and sticks of hard candy, the Brighton rock for which the film is titled, are put to nefarious use. Unfortunately, each individual element remains too remote – too self-contained – to allow for any appreciable overarching tension. 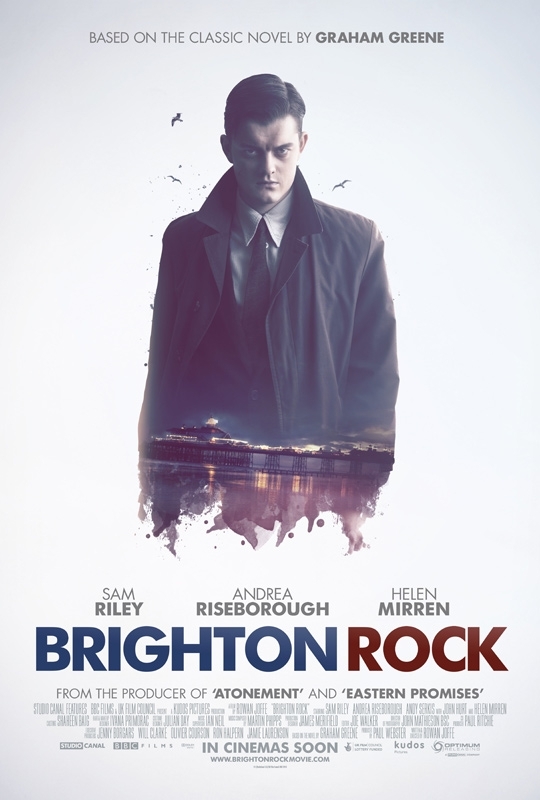 BRIGHTON ROCK is the second screen adaptation of Graham Green’s 1938 novel of the same name (the first was produced by Charter Films in 1947), and it’s the rollicking ‘60s milieu that both makes this version distinct and accounts for most of the changes, some more welcome than others, that Joffe, who also wrote the screenplay, makes to the story. The raw plot is consistent with the book: When a murder is unwittingly discovered by a naïve 16-year-old waitress named Rose (Andrea Riseborough), Pinkie, the unlikely 17-year-old leader of Brighton’s mob - and the killer - goes to violent and emotionally manipulative ends to protect his alibi. The larger themes of the story, however, are altered to suit the background historical events, namely the 1964 youth riots that plagued Britain’s coastal communities. Pinkie’s lightening ascendancy to top dog of a gang composed largely of much older hounds is, of course, spotlighted. More interesting, though, is the contrast between Pinkie, a youth who desperately surrounds himself with adult trappings in order to convince himself – and his reluctant lackeys - that his rage has matured into purpose, and Rose, whose true youthful recklessness and fanciful notions of love actually do solidify into a grown up emotional honesty, but only after being forced up against Pinkie’s insistence that blind loyalty to one’s sins and empty convictions is a vital component of adulthood. In his novel, Greene uses this contrast to explore each character’s relationship with Catholicism, and the larger balance of good and evil. Joffe’s chronological recontextualization applies it to socio-cultural ideals and the relationship between WWII-surviving Britons and their disaffected peacetime progenies. Pinkie sees himself as an adult, and, therefore, wholly removed from the chaotic rabblerousing of Britain’s youth, but the devil-may-care, near-nihilistic thuggishness with which he approaches his mob leadership shows otherwise. He lacks the ideological fundaments and sense of social justice that allow organized gangsters (or, say, governments) to perpetrate questionable acts while maintaining order in their communities, and so, just like the deckchair-hurling Mods and Rockers, his tactics for social empowerment involve base, anarchic brutality. (To highlight this point, Joffe even allows the well-dressed Pinkie, who rides a stolen scooter, to get momentarily lost in a sea of seeming-dopplegangers - an army of Mods.) Viewed along side the recent spate of so-called “flash mobs” in both Britain and America, this aspect of the film, which was released in Britain last February, feels utterly timely... even eerily prescient. Unfortunately, on top of these cultural notions, Joffe also tries to wrangle in Greene’s exploration of Catholicism, which takes over as Pinkie’s and Rose’s relationship develops. This makes the entire structure feel stilted, dividing the movie between first-act sequences of pier-trashing mayhem and maudlin third-act crucifix gazing. Did I mention that Helen Mirren’s in this movie? If I didn’t, it’s because both her and her character, the plucky, sexually self-assured restaurateur, Ida, who’s introduced when her friend is murdered by Pinkie’s gang, are grossly underused. In Greene’s book, we move back and forth between Pinkie’s murderous goings-on and the amateur detective work of Ida, whose dogged pursuit of Pinkie helps fill in the gang’s back-story, while also providing a righteous and loving foil to Pinkie’s numb, swollen hatred. Here, Joffe seems so interested in lingering on Pinkie’s manipulation of Rose, that Ida gets lost amid mob politics and treacherous romance, becoming little more than an unheeded mother figure, trying to rescue Rose through nagging and lectures that only fleetingly betray Ida’s true strength of heart. The result is a slow-building moral tug-of-war between Pinkie and Ida that never quite manages to fully materialize.